This brochure contains34 pages and is dated 1994. To avoid confusion I like to be honest when describing brochures. I would describe this one as very good condition. All brochures are sent 1. This brochure contains30 pages and dates from 1994/1995. All brochures are sent 1. To avoid confusion I like to be honest when describing brochures. I would describe this one as good but used condition. 32 page booklet, well illustrated, English text. Publication number STC 7593. 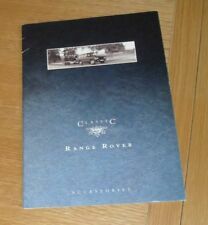 This is an original sales brochure on the Range Rover P38A from 1994 with 12 pages / sides (including covers) and English text for the British Market. Rover Publication Ref: 2007/94. RANGE ROVER 1994 MODEL BROCHURE. 8 pages including covers, plus 3/4 size text pages, inside front & rear, For models, 4.0 V8 petrol, 2.5 diesel, 4.6 V8 petrol, Ref. Crease to top left corner, plus other light overall ageing marks, STILL GOOD CONDITION, Item size, 29.5 x 21 cm approx. 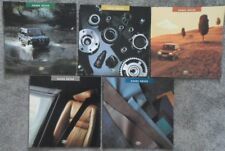 This is a set of 5 different original large format sales brochures on the Range Rover P38A from 1994, each with 12 - 24 pages / sides (including covers) and English text for the British Market. They cover the car, interior, performance & specification, interior / exterior colours and accessories. Range Rover Brochure And Price List 1994. Condition is very good. My feedback is 100% positive over 15 years. An original piece, this is not a reproduction. Please see my other listings-I will combine postage at no extra cost. Dispatch will be by Royal Mail, 2nd Class Signed For in most instances. INTERNATIONAL POSTAGE: Will be £5 anywhere in the world. Dated 1994 and covers 1994-1995 models. Good used condition, 'Spanish' written to top of front cover in pen. Well illustrated, English text. Dated 1994 and covers 1994-1995 models. Includes Range Rover 4.0 V8 Petrol, 2.5 Diesel and 4.6 V8 Petrol models. LAND ROVER RANGE ROVER. A4 brochure, printed paper, 10 pages, in English. It couldn't have been better. AAA ' from c 1. This brochure contains8 pages and is dated 1994. All brochures are sent 1. To avoid confusion I like to be honest when describing brochures. I would describe this one as good condition. Vogue LSE 4.2 V8. Vogue SE 2.5 TDI. Vogue 2.5 TDI. Vogue SE 3.9 V8. Vogue 3.9 V8. This brochure contains32 pages and is dated 1994. Within the brochure there are details on. To avoid confusion I like to be honest when describing brochures. 2.5 DT, 2.5 DSE. 4.0, 4.0 SE, 4.6 HSE. RANGE ROVER PRICE LIST. Dated 1st September 1994. Dated 1994 and covers models from 1994-1995. 4 page folder, well illustrated, English text. Original Sales Brochure for the Land-Rover Range-Rover, 1994. Full Colour 8-Page/16-Sides, Good Clean Condition with no tears. 10.5" x 10.5". Do not bend ” envelope. Range Rover Accessories. 14 smaller pages of text only between each page. I will send anywhere in the world. Number of pages. This is a nice double fold brochure (6 sides) on the Range Rover 3.9 Litre V8, 4.2 Litre V8 and 2.5 Litre Turbo Diesel for early 1994. Item format : Folding brochure. Brochure size (closed) : 18cm x 28cm. Dated March 1994 and covers 1994 models. 32 page booklet, well illustrated, German text. 8 page booklet plus 4 single sheet inserts and unused order form, well illustrated, English text. Very good used condition, 'OCT 94' written in pen to upper edge of front cover. RANGE ROVER Sales Brochures Pack From 1994 This Pack Consists of the Following Brochures Presented in an Box: Interior Brochure, Stapled 20 Pages Sales Brochure, Stapled 24 Pages Specification, Stapled 8 Pages Sales Brochure, Stapled 24 Pages Colour Chart, Stapled 8 Pages Timeless Gifts, Stapled 8 Pages & Price List, 4 Sided Folder ILLUSTRATIONS: Colour Photographs. LANGUAGES: English. SIZE APPROX: Brochures Measure 10 ½”x 10 ½”. CONDITION: Overall condition is GOOD/VERY GOOD. The box is lightly soiled, has crease marks & storage marks. Some brochures are creased but otherwise are in a very good clean condition. Please see attached photographs and if you require any further details we will be only too happy to assist. Another item from POOKS MOTOR BOOKS. Dated September 1994 and covers 1994-1995 models. 4 page folder, unillustrated, English text. RANGE ROVER. COLOURS TRIM. Sent in hardback or jiffy style envelope. PUBLICATION NUMBER: 2005/94. 32 page booklet, well illustrated, English text. Very good condition, very light rubbing to parts of white front cover. Range Rover 4.0 SE, 4.6 HSE, 2.5 DSE, 2.5 DT. RANGE ROVER Sales Brochure. Dated 1995. I HAVE A HUGE COLLECTION OF ALMOST 5000 AUTOSPORT MAGAZINES RANGING FROM 1950s TO 2007. 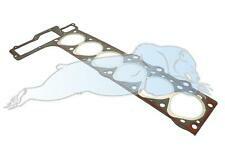 ALLMAKES Head Gasket 1.87mm Replaces 2 Hole or 3 Hole Type Range Rover 95-02 2.5 BMW Diesel 1995 - 2002. Allmakes STC2031 Gasketcylinder Range Rover. Range Rover. 2.5 BMW Diesel. 1.87mm Replaces 2 Hole or 3 Hole Type. Beautiful original brochure sales brochure. Range Rover / Land Rover. This brochure is in German! Spare parts must be sought out on the spot. For pickup with mouldings of a paradise to the Browse. old, rare & incredible. FREELANDER TD4 AND FREELANDER 2 TD4, RANGE ROVER TD6 AND TDV8, RANGE ROVER SPORT TDV6 AND THE TDV8. THE DEFENDER TD5, AND PUMA, DISCOVERY TD5 AND TDV6. BROCHURE IS IN EXCELLENT CONDITION. NICE ADDITION TO HAVE IN ANY LAND ROVER COLLECTION OR IF YOU ARE THINKING ABOUT AN ENGINE REMAP. Range Rover brochures. Range Rovet 1995 prices size 20 by 20 cms with 4 pages. 1 size A4 with Hammond Stamp on front cover 36 pages dated 1995.